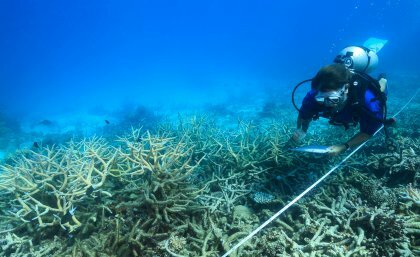 Scientists measure coral mortality following bleaching on the northern Great Barrier Reef. Photo: Tane Sinclair-Taylor. 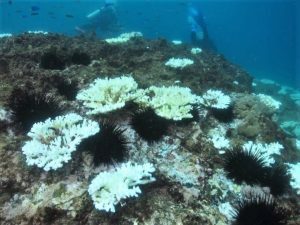 University of Queensland researchers are part of a team that will conduct Great Barrier Reef aerial and underwater surveys this month as coral bleaching occurs for the second year in a row. The work coincides with a report in the journal Nature today, which says the reef’s resilience is waning rapidly. UQ School of Biological Sciences researcher Professor John Pandolfi said scientists from UQ and other institutions would compare the extent of coral bleaching damage that had occurred this summer with that of last summer. Professor Pandolfi is one of 46 researchers who contributed to the Nature report. 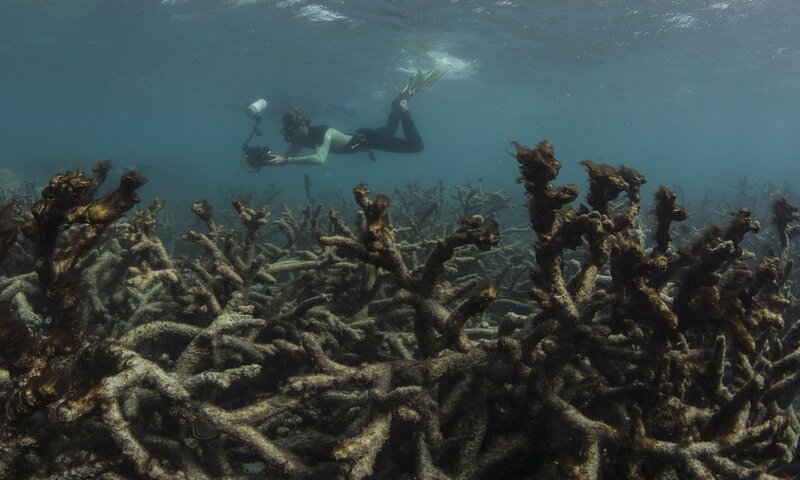 He said coral bleaching events should not be seen as individual disturbances to reefs, but as recurring events that threatened the viability of coral reefs globally. “We have known for some time that ‘refuge’ areas nearby help reef coral rebound after a bleaching event, but last year’s bleaching has shown that unfortunately this ability breaks down as bleaching becomes more severe,” Professor Pandolfi said. 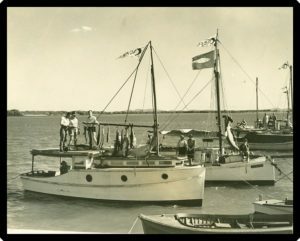 Original article published on UQ News. 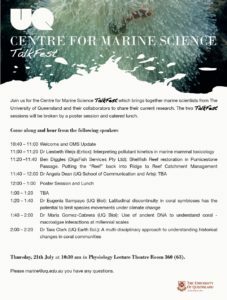 Marine Palaeoecology lab members presented research recently at the Centre of Marine Science TalkFest at the University of Queensland. Presentations came from Dr Eugenia Sampayo and Dr K-le Gomez-Cabrera, while Carrie Sims presented a poster during the lunch break. 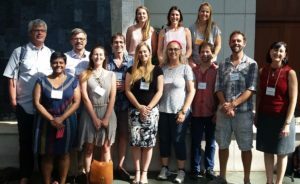 Marine Palaeolecology Lab PhD student, Chelsea Korpanty, recently attended the Australian Earth Sciences Convention (AESC) in Adelaide to present preliminary research entitled: An ecological assessment of a Late Miocene coral assemblage near Rowley Shoals, Roebuck Basin, Western Australia. This research stems from an International Ocean Discovery Program (IODP) expedition that Chelsea participated in 2015 aboard the JOIDES Resolution along the Northwest Shelf of Australia (Expedition 356: Indonesian Throughflow). Her presentation at AESC was given in a topical session specific to the results of recent and upcoming IODP expeditions in the Australian-New Zealand region. 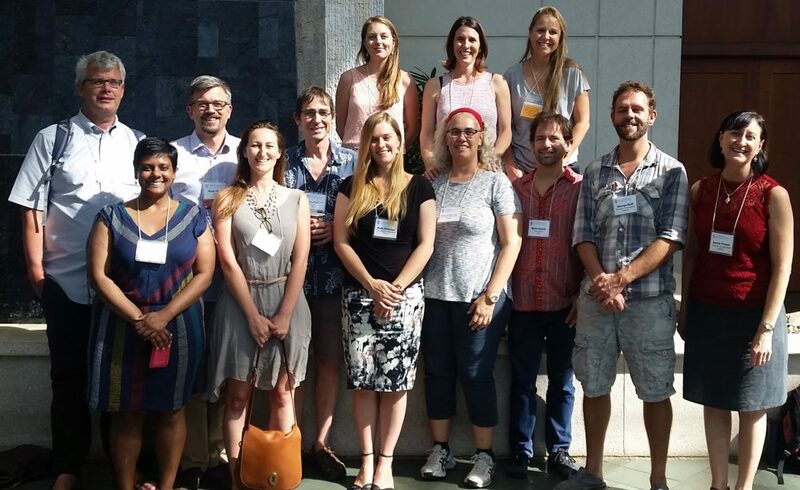 Of the seventeen oral presentations in this session, most were given by Australian- and New Zealand-based IODP researchers, two by PhD students, and several by international IODP researchers from Europe and the United States. The session overall was very engaging and informative, generating many questions and facilitating discussions between presenters and the audience. About 550 delegates attended the AESC, which is the biennial convention of the Geological Society of Australia. A recent article in The Guardian by Professor John Pandolfi. 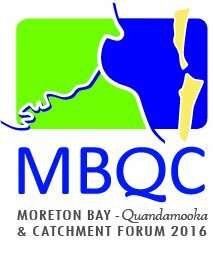 We’ve been hearing a lot lately about the state of the Great Barrier Reef and the major threat it faces. Sometimes it feels overwhelming – reefs are dying and it seems nothing can be done. Actually there is much that can be done, from the Australian government really putting our money where its mouth is, to understanding that science must be at the basis of all action. Here I outline five things that need to be done right now to save the Great Barrier Reef. 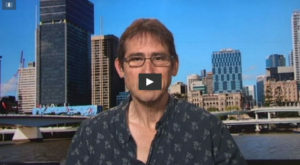 Professor John Pandolfi from the ARC Centre of Excellence for Coral Reef Studies explains the latest report on bleaching, which has found 50 per-cent of the northern parts of the Great Barrier Reef are dying.